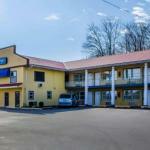 Free internet complimentary breakfast and affordable rates are the draw at the Rodeway Inn Lewisburg less than two miles from downtown. The two-story Rodeway Inn houses 33 rooms all offering free high-speed internet cable TV and complimentary local calling. Non-smoking rooms can be requested. The hotel serves a free continental breakfast every morning and the adjacent restaurant and lounge help cure hunger pangs later in the day. If you prefer to cook for yourself don't miss the outdoor barbeque area. Fax service is available as is parking. The Rodeway Inn is less than two miles from Bucknell University and downtown a treasure trove of shops dining and entertainment. Williamsport site of the Little League World Series and Little League Baseball Museum is 30 minutes away. Bald Eagle State Park where visitors hike fish swim and canoe is just over an hour away. State College and Penn State University are an hour-and-20-minutes from the hotel. University Park Airport and Harrisburg International Airport - Olmsted Field are both 70 miles away.